Given they share all but three of the same letters, you’d think the AOC G2460VQ6 would be pretty similar to the G2460PF I reviewed a couple of weeks ago. To some extent, they are – both share an almost identical outward appearance with an understated red stripe down the lower bezel, and each has a 24in TN panel that supports AMD’s adaptive frame-rate technology, FreeSync, which makes your games appear smoother if your graphics card happens to be struggling a bit. The main difference comes down to refresh rate. Whereas the PF went all the way up to 144Hz, the VQ6 maxes out at 75Hz. 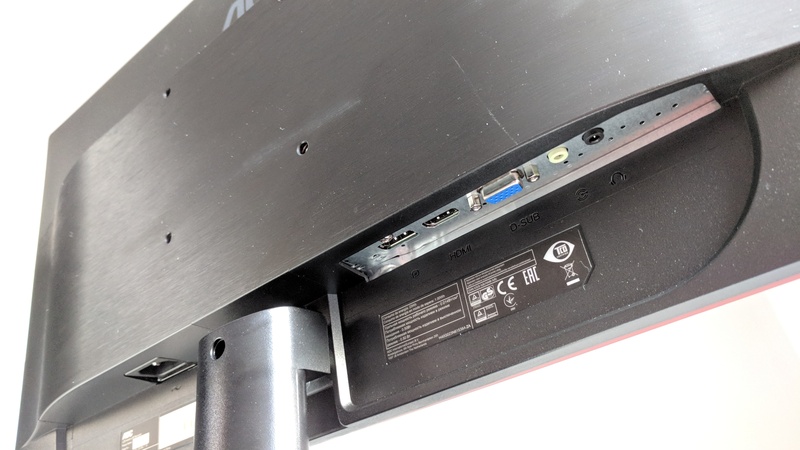 The VQ6 also comes with a slightly different set of ports, offering VGA, HDMI and DisplayPort, but no USB hub or DVI-D, and has a fixed, tilt-only stand. Essentially, it’s a stripped down version of its PF sibling, and comes with a price to match, the lowest I’ve seen being £135 compared to the £210 now demanded by its superior stablemate at time of writing. Is it worth considering over our current 24in champion in our best gaming monitor rankings, though? In many ways, the VQ6 feels a little superfluous in the face of the PF. I’d certainly pay the extra £75 for an adjustable stand and higher refresh rate, but the VQ6 has a secret weapon up its sleeve. Whisper it, but the quality of its panel is actually better than the G2460PF. I had to do a bit of tweaking in its onboard menu system, but I managed to get its sRGB coverage up to 97.9% with my X-Rite i1 Display Pro calibrator, which is pretty impressive for a TN screen. Most IPS displays would be chuffed to do much better, so the fact AOC’s managed to squeeze this much colour accuracy out of this type of panel is pretty good going. 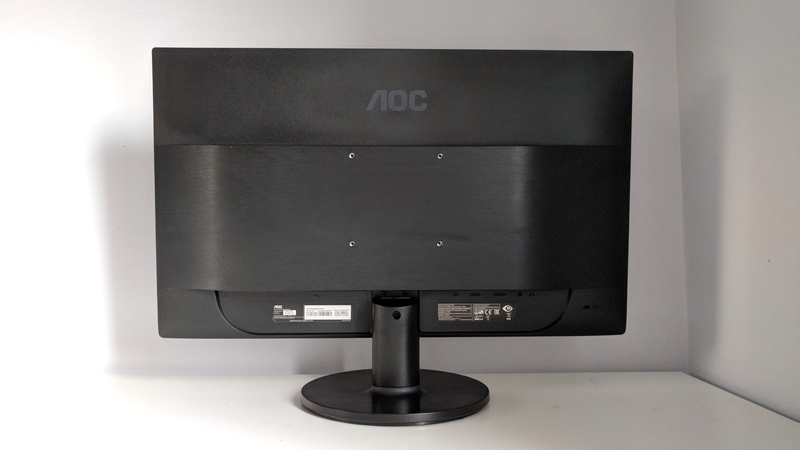 As a result, colours and images looked almost just as rich and vibrant on the G2460VQ6 as they did on my AOC Q2770PQU reference monitor, which has an IPS screen – see our Best gaming monitor and buying guide article for more info on all the different panel types. The VQ6’s excellent contrast ratio of 1263:1 also provided plenty of detail in darker shadow areas, and once again outperformed the G2460PF. Admittedly, the VQ6 wasn’t quite as bright as the PF, topping out at roughly 300cd/m2 as opposed to over 380cd/m2, but I didn’t really feel like I was missing out on much here, as even staring at a 300cd/m2 screen for a prolonged period of time is going to start tiring your eyes out. Fortunately, AOC’s thought ahead about this and included its anti-blue light technology to help reduce eye strain over long gaming sessions. Another upside to a slightly lower overall brightness is a lower, more accurate black level, which measured in at a respectable 0.24cd/m2. The PF, by comparison, only managed 0.37cd/m2. Since it’s part of AOC’s gaming line-up, the G2460VQ6 also comes with a variety of gaming colour profiles, including FPS, RTS and Racing options, plus two generic Gamer modes. Personally, I found all five of them to be far too cool for my liking (cool as in blue, not ‘down with the kids’ kind of cool), and none of them let you mess with the colour temperature, either, making them pretty inflexible when it comes to adjusting for colour accuracy. Personally, I’d advise sticking with the Standard profile and altering the User colour temperature setting to reign in its strong greens, as I did above to get that 97% sRGB figure. Last, but not least, there’s that 75Hz refresh rate. You’ll have to use the monitor’s DisplayPort connection to take advantage of it, but having that extra bit of headroom is a nice little upgrade over your traditional 60Hz monitor. Yes, it’s only a small upgrade compared to the PF’s 144Hz refresh rate, but I’d argue it’s a better fit for those with slightly older graphics cards, if only because 75fps is a bit more achievable than 144fps. It’s also a good way to extend the life of your current card if you don’t fancy paying over the odds for something more modern. Throw in AMD’s FreeSync technology as well, which helps pull up the frame rate in the event of a significant drop and prevent any pesky stutter, and the G2460VQ6 could well be your ticket to a new and improved gaming experience without breaking the bank. Again, I’d probably spend the extra on the G2460PF to get a better stand and a few more ports, but if your budget doesn’t stretch that far, the G2460VQ6 certainly won’t disappoint. Tagged with feature, FreeSync, Hardware, Monitors.